Your soul speaks to you in so many ways. All you have to do is listen. As children we’re taught to listen to everyone else except ourselves so by adulthood we’ve lost touch with that innate sensing of knowing we’re born with. As the world gets noisier, and other people’s opinions get louder, we need to remember how to trust ourselves now more than ever. There is an infinite source of wisdom within you and whether you call it your soul, your spirit, your intuition or your gut instinct, it’s been guiding you your entire life (whether you knew it or not). It’s time to look inside for the answers. It’s time to reconnect to our own guidance. Some people receive intuition as words or symbols but for most of us it’s a more subtle feeling that’s easy to miss when we’re caught up in our heads! But it’s perfectly possible to cultivate an on-going connection to your intuition and live from a more aligned state of being. From life-changing decisions to smaller daily choices, when we’re tuned in to our inner guidance we have an ally on our side that will never steer us wrong. And here’s the thing: it doesn’t require you to sit in the lotus position for an hour and you don’t need to “believe in” anything either. Your intuition (the wiser, more expansive part of YOU) is communicating with you all the time — the key is to practice tuning in, listening and acting on the guidance. In this practical and immersive three-week course we’re going to explore different ways to connect with and decipher our intuition. 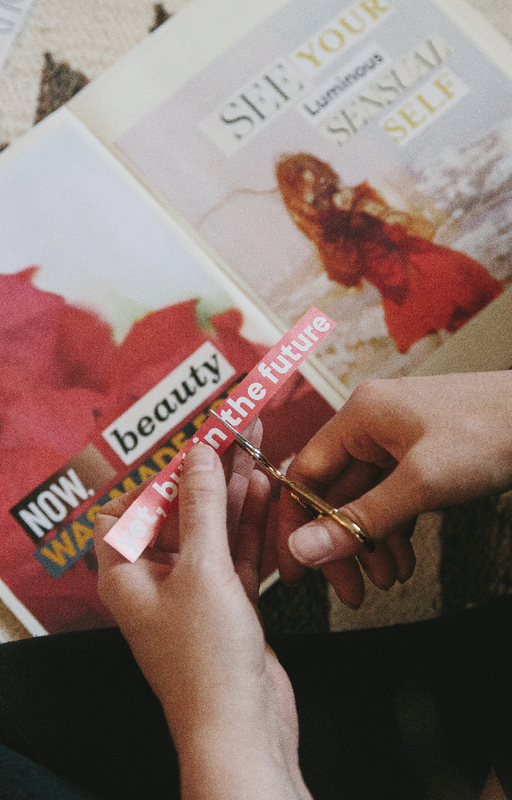 We’ll use journaling and collage to connect to our wisdom directly, learn the difference between spontaneous and applied intuition, identify where we feel our intuition in our bodies, practice daily connecting and so much more! By cultivating a solid relationship with my intuition, and practising tuning in no matter where I am, I’ve been able to strengthen my relationship with myself. I trust myself to make the right decisions and I check in with ME first before turning to anyone else (in all things!). If you’ve ever said “that just doesn’t feel right to me” you are already in touch with your intuition and by the end of the course you’ll be moving through your days with a reliable connection to your intuition and a radically deeper connection to your self. Your Soul Speaks is a three-week practical exploration of our intuition — how we hear it, how we can communicate with it and how we can use its guidance in our everyday lives. We’ll explore connecting to our inner guidance through the written word, collage and found imagery, personal and universal symbolism and mindfulness. We’ll also uncover the different ways our intuition speaks to us through our body and our environment. By the end of the course you’ll be able to tune in at any time no matter where you are! You’ll get an email every week day (Monday to Friday) for three weeks. Each email will contain that day’s lesson — a combination of words, photos, prompts, guidance and inspiration. On the last day of class you’ll receive a beautifully-designed ebook containing all the lessons to download and keep forever. No, there are no set times you have to be in class. You could read the day’s email the moment it hits your inbox or save them all up for the weekend. I’ll be hanging out in the Facebook group every day but you don’t have to if you don’t have time. Expect to spend about an hour or two on the course each week. Gift yourself this time but don’t worry about "falling behind" — make this work for YOU and your schedule. DO I NEED TO BE PSYCHIC OR BELIEVE IN SOMETHING MAGICAL?! HA! No you don’t, I promise. Think of your intuition as just another sense. You can see and hear and touch. You have a sense of smell and a sense of taste. Intuition is your sense of knowing. Just as you can develop your palette and learn how to appreciate a wider bouquet of scents, you can strengthen your sense of knowing too. A richer connection to your SELF. Lots of practical tools so you can connect to your intuition anytime. A deeper understanding of how your intuition communicates with you, where you feel it and how you can have an on-going conversation with it! “I was totally new to tarot — had never even held a tarot card — so the course has given me both confidence and curiosity with the cards. I really took to the 78 mirror approach. The course has given me rationale for using the cards. None hold any fear for me. The tarot is such a great tool for thinking things through. Most days I do a 3-card draw at the beginning of the day. Once a week I do my weekly plan using the tarot which ends up with me focusing much more on how I want to be rather than what I have to do. This works well for me. If I’m feeling bit down might use them to assist me to work out what’s going on, what I’m really feeling and how to perk myself up a bit. I now have a much better language/range for understanding and explaining how I feel. Thinking about it, I don’t think I have ever felt stuck or got that hopeless feeling since I started using the cards. If I feel stuck I draw some cards. They always help me to think things through. Overall — I love my decks. Love the artwork. Tarot is something I know will be with me for rest of my life. The cards just help me to think things through. They really do add another dimension.”?